First of a little series of gift ideas that I’ve found while doing my online shopping – thought I’d share as the deadline for buying gifts is approaching and everyone appears to be getting increasingly stressed. I’ve put together some of the gift ideas suitable for tea / coffee lovers and those who need a caffeine boost while burning the midnight oil. The Blackboard message mug is a simple idea. But a novel one at that. As I get up for work a good 5 hours earlier than my partner gets up for work I always leave post-its with various messages in the hope that he will see them (usually on the kettle because I know that he always makes tea without fail). To me this is the perfect solution. Only worry is the messiness of chalk. Available from: Menkind, WH Smiths and Amazon. Another novelty mug for your collection, or for the geek in your life courtesy of the gadget shop. I’m not normally lazy when it comes to stirring my tea, but this sounds fun. 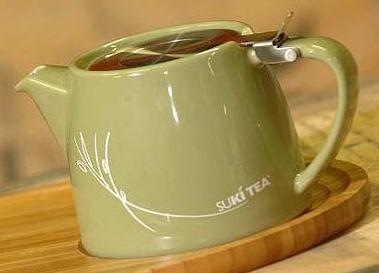 More traditional gift is this beautiful teapot (with inbuilt infuser) from Suki Tea – there are a range of colours and the teapot can also be bought as part of a gift set (£32.95) or as part of a special Christmas gift set (£35.95) which I have asked Santa for. They also have a fabulous selection of teas to choose from. Other great teapots and mugs that I love come from TG Green’s Cornishware Range. Beautiful range and the excellent news is that they have just opened their online gift shop. Pure Classic Kitchenware.